Before you read any further, you need to read this post about how Kate Upton clearly proposed to me. Ok, so you read it, thought it was funny… blah, blah, blah… this BP character is a delusional stalker, right? Au contraire. So, I wrote the story and tweeted the link, attaching the Sports Illustrated Swimsuit Issue, Kate Upton herself, my buddy Gravy, and MJ Day, the Senior Associate Editor at Sports Illustrated SWIMSUIT. Welp, MJ apparently agreed with my post because she soon tweeted this. Simple enough… she read the story, retweeted me and asked her friend Kate if she could be in our wedding. OUR wedding. I can’t make this stuff up folks. This is her good friend reading my post and agreeing with me. Just when you thought that was the end of the story… Kate drops a heart stopping bomb on the Twitter planet. Gulp. Holy crap. Um… I, uh… well, ya see… breathe, breathe… Hi Kate, BP here… Hi? I kinda thought that proposal was a joke? I guess not… seeing as you already have your wedding, uh, dress, picked out. Do you make hearts stop beating often? Just curious. Well, as you can see… not only did she propose to me… she already got the dress. This tweet, obviously, was then retweeted a billion times by all of her Twitter admirers. Well played, Kate, well played. I’m starting to like you more and more by the second. Is Kate Upton married? Not yet. 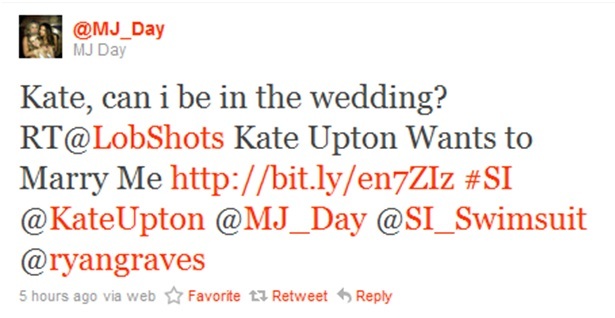 But, her girl MJ will be in her wedding, it seems… her response? Thank GOD? I mean that much to you gals? I’m flattered, I really am. So, when’s the date? Can I bring my wife? This entry was posted in Celebrities, Fashion, Sports, TV and tagged Kate Upton, Kate Upton Wants to Marry Me, MJ Day, Senior Associate Editor at Sports Illustrated SWIMSUIT, Sports Illustrated, Sports Illustrated Swimsuit Issue. Bookmark the permalink.